Just as there is a distinction between the commonly used term “classical music”, which includes European music as early as the 12th century (and even earlier), and the “classical style” or “classical period” of music starting at around 1750 with composers like young Franz Joseph Haydn, and ending around the 1820’s and 1830s as composers follow Beethoven’s lead of creating more expressive and extreme music, there is a distinction between “progressive rock music”, music that stretches and extends the vocabulary and significance of the rock music prevalent at the given time, and “progressive rock style” or “prog rock”, music that generally defies a simple definition, but generally borrows elements from classical and jazz, and often deploys complex time signatures, mixed meters, classical-period chord modulations, use of arpeggios (broken chords), lengthy instrumental sections, flashy displays of instrumental technique, musical contrast (including contrasts in tempo, texture, instrumentation), dramatic effects, and sharp angular rhythms. Generally prog rock musicians have had some classical training or jazz background and influences to their music often include twentieth century “classical music” composers like Stravinsky, Prokofiev, Bartok, Janacek and Ginastera and be-bop and cool jazz. Released on July 19, 1968, Family’s debut album, Music in a Doll’s House, was created during a category-five hurricane of “progressive rock music”, being contemporaneous with progressive music from Hendrix, Zappa, the Beatles, and many others. Such is the breadth of the late-sixties music revolution that even established jazz players are pulled into this vortex, ultimately embracing electronic instruments and playing to audiences that frequent both rock and jazz concerts. And, in 1968, we find more occurrences of jazz and classical instruments in rock music than ever before. With Music in a Doll’s House, we have three vocalists that play multiple instruments: the electric bass player plays violin and cello, the lead vocalist plays tenor sax and harmonica, and the third vocalist plays tenor sax, soprano sax and harmonica — to which is added trumpet and mellotron Much of the music on the album sounds notably different than anything else released in July of 1968 and even though the are several blues-based numbers, most of the music is only remotely related to music of either American rock and roll or the music of the British Invasion. In short, this is a distinct rock album carving out is own identity, establishing a level of musical excellence and character much in the way of such albums as Pet Sounds, Revolver, Sgt. Peppers, Odessey and Oracle, Are You Experienced and other landmark albums of 1966, 1967 and 1968. So its appropriate to place Music in a Doll’s House in this first progressive rock category of “progressive rock music.” More significant historically, is that it is the earliest album one can unequivocally place in the second category of “prog rock” due to a majority of the album sharing those “I can’t define it, but I know it when I hear it” qualities of the progressive rock style. The album is far from perfect: it suffers from some of the excesses of progressive rock including over repetition, whereas a group like the Beatles, for example, whether influenced by George Martin or due to their collective sensibilities, or even their individual maturity as composers, rarely repeated a verse or a chorus one too many times — the most notable exception being “Hey Jude” which appears to somehow have become a blueprint in the progressive rock genre for overextending the repetition of a chorus or other musical section. And so we find a little of this excess on this first Family album. We also find some blues-based numbers that are certainly not classifiable as being in the prog-rock style. However the first four tracks of the album, including Dave Mason’s “Never Like This”, are solidly both progressive and in the progressive rock style. The impact of this album is also significant, from forcing the Beatles to abandon their planned title of A Doll’s House for their upcoming 1968 two LP White Album, to Roger Chapman’s extreme vibrato vocal delivery influencing others prog vocalists such as Bernardo Lanzetti of Acqua Fragile and PFM. The style of these first four tracks will influence, directly or indirectly, Genesis, Hoelderlin, and Marillion. There is a surge of emotional excitement I get when I hear the best prog-rock music, similar to the feeling when I hear Thelonious Monk, Bach, or Beethoven. I get caught up in the music, and if I started listening with the intent to stop in a few minutes to watch something on TV or do some specific task, I find that once caught up in the music, I cannot pull myself away for something as relatively unimportant as PBS’s Nightly Business Report, tending to chores, or eating dinner. Music is often classified into genres, but the main measure of any music is its quality and how vital it is, both in its own time and generations later. Music in a Doll’s House does sound dated in parts, but those opening four tracks still retain some of the magic they had when first released in July, 1968, heralding the beginning of the prog rock era. Released on July 22, 1968, with it’s title and cover acknowledging the Beatles’ “Lucy in the Sky with Diamonds” and the psychedelic rock movement, Miles in the Sky is as much or more of a forerunner of an entire genre of music as is Family’s In a Doll’s House. And as the case with Music in a Doll’s House, Miles in the Sky sounds different than any other album from the summer of 1968. Miles Davis’s previous album, Nefertiti, began hinting at elements of the yet-to-come jazz fusion, but Miles in The Sky moves forward even further and begins to coalesce the necessary elements to produce this new mixture of jazz, rock, funk, and R & B soon to be known as fusion. Most music historians will identify In A Silent Way as the first Miles Davis fusion album, with some giving a nod to Filles de Kilimanjaro, but Miles in the Sky is at least a transitional album. This is not due to the inclusion of the electric piano and electric bass on the first track, “Stuff”, or the inclusion of George Benson playing a relatively traditional jazz electric guitar on “Paraphernalia”, but is based on the creation of a different type of post-bop that has incorporated funk and a modal style a step closer to the psychedelic rock improvisation of 1968. Musically there is a lot to assimilate here. The level of diversity is high, with funk rhythms alongside semi-impressionistic harmonies. Each track takes a different tact and the length of the first side at close to 30 minutes is rather impressive for the time contrasted to the average of less than twenty minutes a side for most jazz and rock albums. The first track, “Stuff” is an intriguing composition incorporating points of musical color into a larger structure that drives relentlessly forward. Miles Davis interest in twentieth century classical music is evident — the emphasis is on the overall character and experience with individual musical events functioning more as points in time, providing commentary and coloration rather than having impact or influence to the overall scope and direction of the piece. This is not only common in many classical music works of the academic composers of the 1960s, but is a prevalent trait in some of the best psychedelic and progressive rock of the late 1960s and early 1970s. There is also the electric nature of “Stuff” which not only incorporates Herbie Hancock’s colorful contributions on electric piano and Ron Carter on electric bass, but also captures an amplified Wayne Shorter recorded from a studio speaker to create a more resonant, forward sound such as produced by an amplified sax in a large concert hall. Add to this the funky, vibrant character of the much of the piece and the result is a very early, but clear-cut example, of jazz fusion. The second track, “Paraphernalia”, recorded about four months earlier than the rest of the album, opens up with some effective rhythmic displacement similar to classical music “hocketing” followed by somewhat disparate solos. The third track, “Black Comedy”, despite its variety of meter is the most traditional in the set and the theme is reminiscent of Thelonious Monk. The fourth and last track, “Country Son” is again quite different, being episodic and free with tempo and texture changes. It’s a shame that no recorded rehearsals of this piece exist, though there is an alternate take available on CD. This album also is the first Miles Davis studio album with just four tracks continuing a trend of longer compositions in both jazz and rock album: soon, one or two selections per side would become a more common occurrence in fusion jazz, psychedelic rock and progressive rock. Miles in the Sky sometimes is treated like a middle child, between the two more impressive Miles Davis studio albums immediately before and after it, but it is still quite good and historically important — providing the necessary groundwork for not only for the fusion phase of Miles Davis, but also for number of future jazz-fusion groups as distinct and different as Weather Report, Brand X, and Nova. Two important trends in radio may not have changed the face of music but certainly assisted in clearing some of the fodder from the pathways. The first was the trend away from playing only singles and music selected by the station manager, program director, or some selection board, to including album cuts in the mix, sometimes selected by the DJ, themselves, particularly in the case of college radio stations. This opened up the range of music and took part of the control away from the record executives that were determining what album songs would be released as single. The second trend was to devote time to more adventurous and progressive music. At first, for some stations this may have been only one segment a week, but eventually. driven by an attractive demographic, ages 17-34, such segments were expanded, or more were added, or in some cases the radio station became a full-time progressive rock station sometimes playing full albums upon their release. And playing good music had the impact of drawing larger listening audiences. 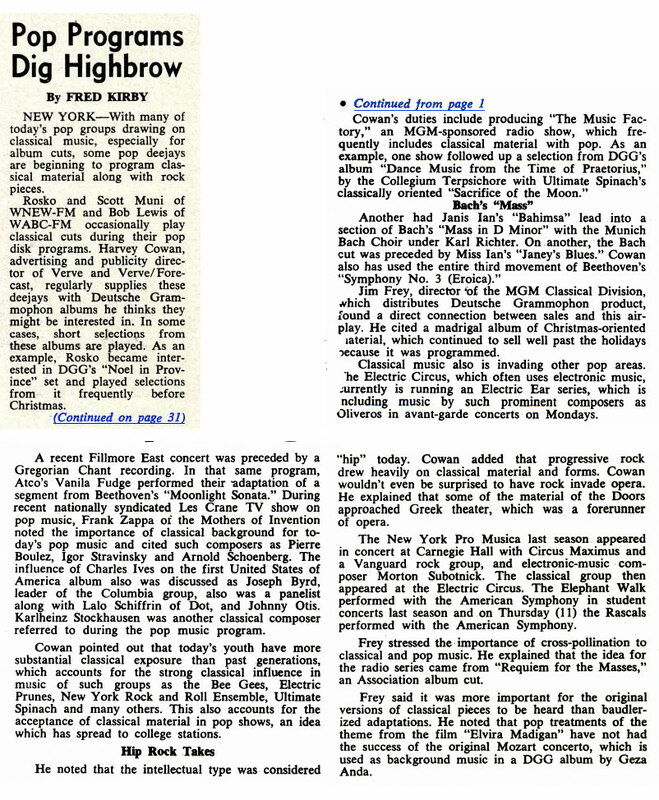 There was no internet, no streaming services, no torrent-sharing sites in 1968, but there was FM progressive rock radio, and it changed not only what music consumers could hear, but, ultimately affected the decisions of record company executives determining what bands to sign and what music to release. Fifty Year Friday: John Coltrane; Jefferson Airplane "Surrealistic Pillow"